For water Divining Workshops, see Teaching Dowsing. Water is a precious resource and can be expensive when taken from public supplies. Owning your own water source from a borehole on your site can be less expensive and the cost of its development should be recovered within a very short period. For a small fee and reasonable travel expenses, Peter Golding will use his water divining skills to consider if you have a convenient source of underground water on your site, its ideal location, depth below the surface, drinking quality and sustainable flow rate that can be abstracted. If this is adequate for your requirements, he will then obtain a quotation for drilling and casing the borehole and pumping the water to the surface. Additional requirements for plumbing can be discussed on site. If your site is far away or overseas, Peter can examine the likelihood of locating a suitable source of underground water by dowsing over a map or sketch of the location. Just send him a sketch of your field, farmyard or garden. This will save time and costs and avoid travelling to dowse a site where the available groundwater is unlikely to be adequate for your needs. Predicted water depth, quantity and quality cannot be guaranteed. 1 Installing steel casing into top of borehole. 2 Percussion rig drilling down through outer steel casing near top of borehole. 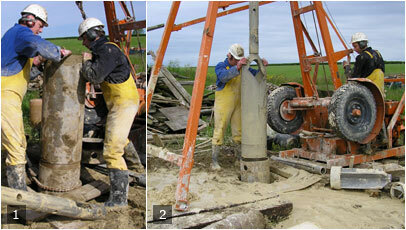 3 Rotary rig drilling borehole for water on a farm near Hagworthingham, Lincs. 4 Rig has reached depth of copious amounts of water where as predicted. 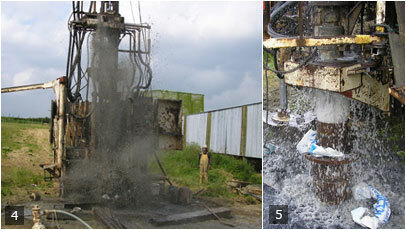 5 Water gushing from borehole whilst drilling to final depth. In November 2007 I was asked to go to Strickley Farm, Old Hutton, Cumbria, to dowse for a location where the drilling company would be most likely to encounter a supply of underground water. Before I arrived, the driller had already drilled two unsuccessful boreholes. I dowsed around the location of his last borehole and concluded that he would have found an underground stream if he had drilled about five feet away from where he had been working. The farmer said there must be water around somewhere because, at certain times of the year, there was a line of springs part way up the steep hill above the farm buildings. The farmer and the driller seemed surprised when I said I wanted to dowse near the top of that hill, above the line where springs sometime occur. They had always thought there would be more chance of finding water lower down; after all, there was a stream in the valley. We climbed the hill, far above any seasonal springs, and I marked a spot where I advised the driller that he should find plenty of water (5 to 8 gallons per minute) at a depth of between 250 and 390 feet (77 to 120 metres). However, the ground was too wet and steep for the machine to get up there at that time of year, so they would have to come back in the summer when it was dry and the farm tractor could help tow the rig up the bank. I heard nothing more about it until mid-May 2010, thirty months later! The driller phoned me to say he had only just started and had drilled to about 80 metres and was surprised when he found plenty of water. For the client's perspective go to the Strickley blog where there are a number of articles in the May archive.